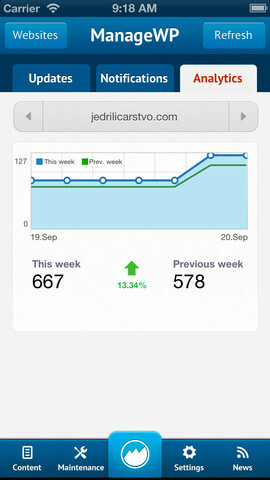 Introducing the ManageWP iOS App! As you will know if you read our initial announcement post back in April, we have been very hard at work on an iOS app over the past few months. Well, the time has now come to announce it to the world formally! 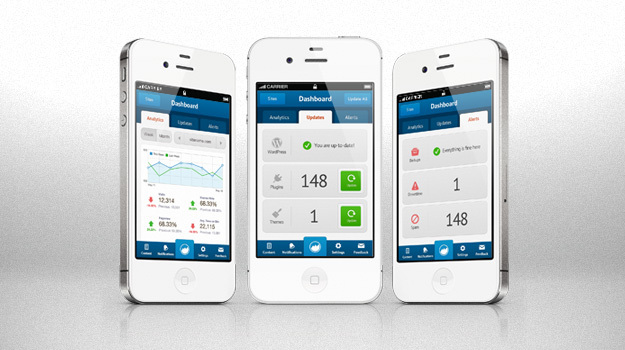 The ManageWP app is now available on the App Store for you to download. It is just the second WordPress-related app to be released on the iOS platform (the other being the official WordPress app) — an astonishing fact. You can go ahead and download it right now! However, we didn’t just set out to develop an app that complements the desktop version of ManageWP. We wanted to develop a means of managing your WordPress sites that in many ways could be even more convenient and easy to use than the desktop version. From a ManageWP user perspective, having toyed around with the app for a couple of weeks now, I can confidently say that the development team has accomplished just that. We are extremely proud of the app and can’t wait for you to get your teeth into it and give us your feedback. But before that, take a moment to check out all of the awesome features we have packed into it! The interface really is as simple as it looks. Load up the app and you can see what updates are available. Hit the ‘Update’ button and ManageWP will take care of the rest! The ManageWP app can immediately inform you of issues with any of your site with push notifications for backups and downtime. You no longer need to fret about whether or not your websites are up and running because you’ll know as soon as there is a problem. 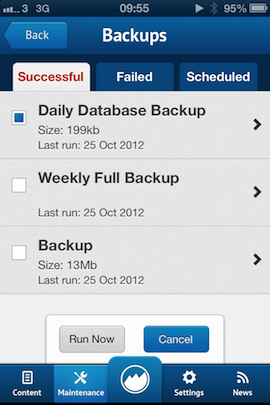 ManageWP also keeps a record of successful, failed and scheduled backups. 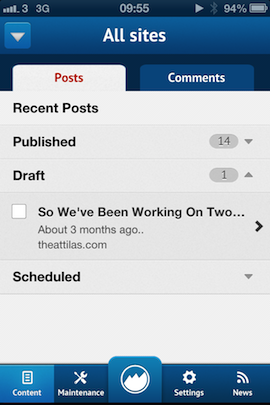 From this screen you can manage your content — whether that be publishing or deleting. You can also view and moderate recent comments. Sound good? We hope you think so. And now we hope you’ll give it a try. We’d love to get your feedback on our new app, so please let us know what you think in the comments section! What is the link to get the app? It is not coming up through the links here. When will it be available in the Canadian I Tunes Store? We’ve pulled the mobile apps from all stores since they weren’t compatible with Orion, a new version of the ManageWP service. Right now you can manage your websites through our Slack app, and we have more integration plans in the future. I just LOVE your product, and I’m anxious for a Retina iPad version! Thank you for such astonishing work! I have a question regarding security. I love ManageWP In its desktop version and I appreciate the security features; notably being able to login via SSL, and having an option to enable double-factor authentification. It makes logging in via ManageWP a much more secure way to run admin tasks, than logging in through my own blog. Especially when I have to use a hotel or airport Wifi. I just downloaded the app, but I’m not sure it allows the same level of security of the data that is transferred over the network. Would you mind commenting on this ? Have just installed on iPhone and iPad. Strangely, I could not find it by searching the App Store on my iPad. Had to follow from the link here. Love ManageWP. Looking forward to trying the app interface. I Love the product, but the iPhone app crashes, and hangs too much. I am looking forward to the update and HOPEFULLY an iPad version? yes? Another upvote for the Android version. I will test out this on my Ipad, but the practicality of that is limited in my usage. However, an android app would mean I could update my plugins and manage my sites while my wife shops at the mall! Looks pretty good, I really like updating plugins when I am not there. but I am having the same problem, it seems to crash a lot when I try to do things. I just hit content, it thought for a second then crashed. We have a new version in the pipeline that will dramatically improve stability. We will make an announcement once it receives approval from Apple. Could you please email support@managewp.com with any reproducible bugs ? Looks good but rather different from the desktop version. The most unfriendly aspect is that the type is so small I can hardly read it (admittedly my eyes aren’t the best though). The app just hung when I tried to clear spam. Likewise it just sat there when I clicked on a post – little circle spinning, not sure what it thought it wanted to do, but whatever it was it just sat there thinking. Overall it seems OK. I’ll play some more. Is the app called ManageWP? I can’t find it on the AppStore! Looks great guys, will be trying it out and reviewing it on my blog this month. Small point of interest… contrary to your second paragraph there are several other WordPress related iOS apps available. 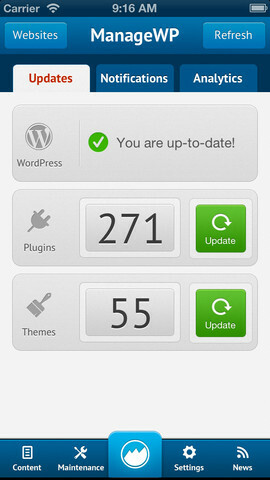 In particular check out Tickera which is a very innovative WP plugin/app product. Looks awesome, but I am android:( Any chance of an Android release this year?